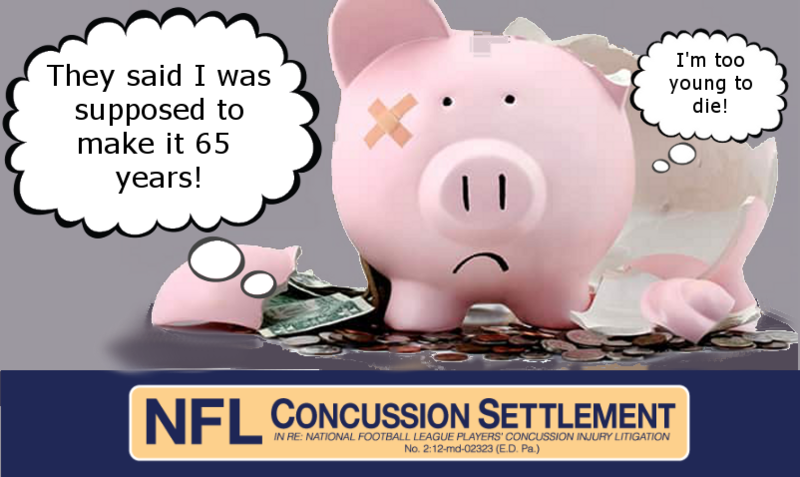 While the NFL Concussion Settlement fund for payment of claims to compensate former players suffering from neurocognitive impairment is uncapped, the fund for class counsel compensation is not. While the NFL is acutely aware of what they’re spending, and fighting claims with a fury, Co-Lead Class Counsel Chris Seeger seems to take no issue with spending with abandon. In a motion filed Thursday, attorney Lance Lubel asks the court to deny Seeger’s most recent fee petition and put him on a budget before there’s no money left. He wastes no time getting to the point. Digest that for a moment. In less than two years, Chris Seeger has spent 90% of a 65-year budget. Lubel reminds the court this projection was not his own, but rather the forecast made by a Harvard law professor hand picked by the court. “The $112.5 million Fee Fund, opined the Court’s appointed expert, Professor William B. Rubenstein, “should be sufficient to fund past, present, and future [attorney] work” so long as appropriate safeguards are in place.” Based on Rubenstein’s calculations Judge Brody awarded Class Counsel $85.6 million (over $50 million of which went directly to Seeger Weiss). Lubel points out that only $13.4 million remains in the fund after the initial payout for pre-implementation work and approval of Seeger’s first petition for implementation work of $9.4 million for work between January 2017 and May 2018. The fee petition of $3.2 million is for work that Seeger claims between May and November 2018. Lubel calculates that if the court grants the fee petition, only $10.2 million will remain in the common benefit fund, and at the current burn-rate of $500,000 per month, this will be exhausted within two years. He points out that Professor Rubenstein recommended growing the fund over time through investment, but the current spending patterns of class counsel have not permitted this to take place. 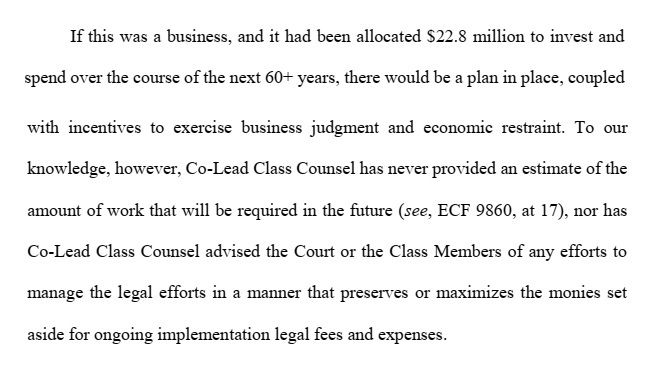 As a result of class counsel’s unrestrained spending, Lubel anticipates that the 5% hold back from each award will be finalized, but instead of accruing the interest that would build that fund, at the current-burn rate of $500,000 per month he projects that the hold back originally estimated at $40 million with accrued interest would. be tapped into in two years. Update: I did some rough math to see how long this might work out. This would come to approximately $112.5 million gone in 4 years and $ 25 million in another 4 Money that was meant to last for 65 years gone in 8. What will happen then? I don’t have an answer to that question. Lubel makes a pertinent point. Businesses have to carefully budget income and investments, as do individuals. Failure to do so generally ends in bankruptcy. What happens if attorney fees are depleted in a class action settlement long before its term has been completed? I’m not aware of this happening previously, and I don’t know what outcomes might result, but I can’t imagine any scenario in which the class members who trusted the settlement would benefit. Lubel urges the court to deny Seeger’s request until a plan can be developed detailing the common benefit work remaining, and how this can be accomplished without dipping into class members’ awards. This is a major point, and at one time an area of anger and confusion among the class. 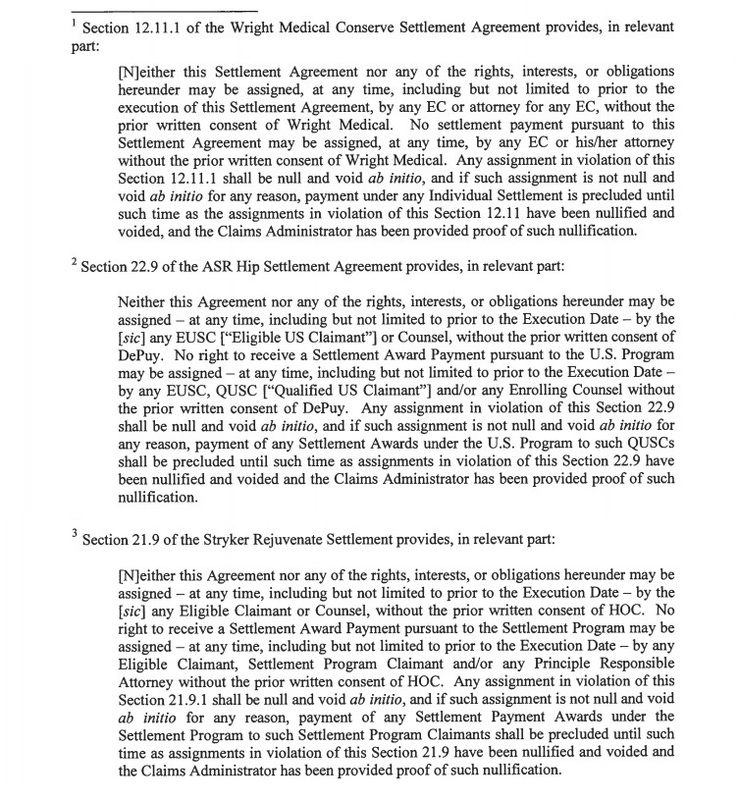 While part of this stems from difficulty in separating individual attorney work from work that is done to benefit the class collectively—and inevitably for class attorneys there will be some overlap as evidenced in the Turner and Smith objections to Podhurst fees—a larger issue is that many class members feel they were deceived when they were told the NFL would be paying the attorney fees. This issue was largely diffused when Judge Brody placed a cap on independent attorney fees at 22% and instructed the 5% holdback to be deducted from the attorney’s portion. While on the surface this looks like a big win for players and their families, looks can be deceiving. Professor Rubenstein’s analysis which suggested the 22% cap makes several good points, in that the higher fees were reflective of great risk of doing an enormous amount of work with no guarantee of any compensation prior to consolidation and class certification. On this point he is correct. What Professor Rubenstein probably didn’t grasp was how difficult the NFL has made the claims process through its incessant obstruction of claims. What is generally viewed as assembling the necessary records and presenting a claim form has turned into hundreds of mini-lawsuits fought on a shadow docket, where attorneys and players have no guarantee of a favorable outcome despite a legitimate diagnosis. Most of these disputes hinge on the “generally consistent” standard of evaluation. In a rare public filing, attorney Wendy Fleishman of Lieff Cabraser Heinmann & Bernstein, objected to denial of a player’s claim that was approved, appealed, approved, appealed again, then approved and appealed yet a third time, with a fourth appeal resulting in an inexplicable denial; the player was diagnosed by a well-known and respected neurologist from a world-class hospital who had been treating the player for four years. This is representative of the level and volume of work independent attorneys are undertaking on behalf of their player-clients. It’s also the kind of work that any additional tampering with a hold-back on awards could jeopardize. Since private attorney fees were effectively capped at 17%, some firms have been reluctant to take on new clients because of the amount of work required for a chance at modest compensation. Some other firms have sold portions of their client inventories to other perhaps less experienced firms because they can’t justify the risk reward ratio. In the time between settlement approval and the subsequent appeals, numerous law firms paid for players’ examinations in order to ensure they were diagnosed with a properly credentialed doctor when the time came for their claims to be submitted. Few are continuing the practice because of the difficulties in recovering their investment. If only 1 in 10 players diagnosed receives a monetary award, then both the hours and expenses invested become harder to justify from a monetary standpoint, leaving players with fewer options of recovery. The settlement’s BAP program is free, but it’s a one-shot deal. While advantageous to asymptomatic players as a benchmark of comparison should they develop problems in the future, if a symptomatic player fails to receive a qualifying diagnosis under the strict protocols imposed, he doesn’t get another shot—no matter how bad his symptoms may become. His personal doctor can’t help him. He must, after the settlement effective date receive a qualifying diagnosis from a settlement approved BAP or MAF doctor. Insurance may cover a MAF exam, but it’s unlikely. That leaves a cash-strapped player with no options. Unless his attorney is willing to pick up the tab and wait for reimbursement once the claim has been approved and paid, the player has no way of receiving a diagnosis, no matter what kind of extra-settlement records may exist to confirm the condition. Further complicating the issue of Seeger’s recent petition, as Lubel points out, no receipts outside a bare minimum spreadsheet that doesn’t identify what the expenses were or identify the individuals performing the work has been produced—at least publicly. It’s possible that something has been produced in camera, or privately through the court, but if that’s true and if documentation exists, then it should be made publicly available to the class, whose stake in the settlement demands transparency. As Carol Bluestein said, “destroying the plaintiff with paperwork is a time-honored legal maneuver.” It’s unlikely there’s been any shortage off paperwork with the NFL’s scorched earth approach to claims and pretty much any issue that arises in which players may find an advantage. 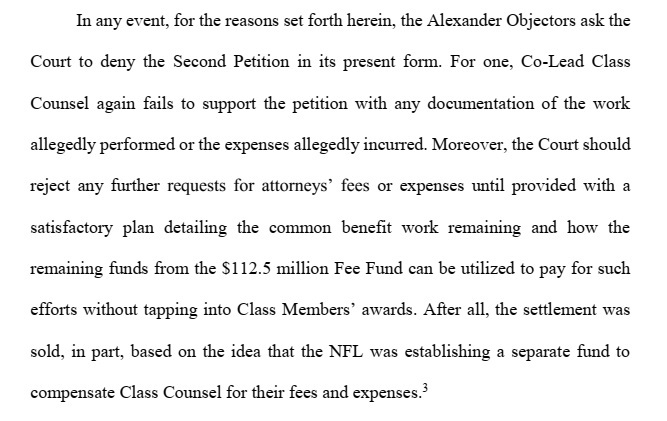 Seeger confirms that the NFL is doing this through this statement in the fee petition. While he submitted strong briefs in opposition to the NFL in both instances, he may have unraveled the value of his own work in an apparent compromise which prompted the NFL to withdraw one of the appeals, which I explain in detail here. While hourly allocations to the various tasks Seeger highlights in his petition were conveniently omitted, there’s enough detail to question if some expenditures were necessary. The Claims Administrator is compensated through the uncapped Monetary Awards Fund, whereas Class Counsel is not. Is it necessary to help with web design that is likely subcontracted to a third party web-developer for actual implementation? While it’s good that the NFL is not given unfettered control of this, is it really necessary for non-medical professionals to be “training” doctors? A hands-off approach that allows them to practice medicine in accordance with sound medical practice and ethics would seem a sounder approach, with the additional benefit of zero cost. Let the NFL do its own ferreting. 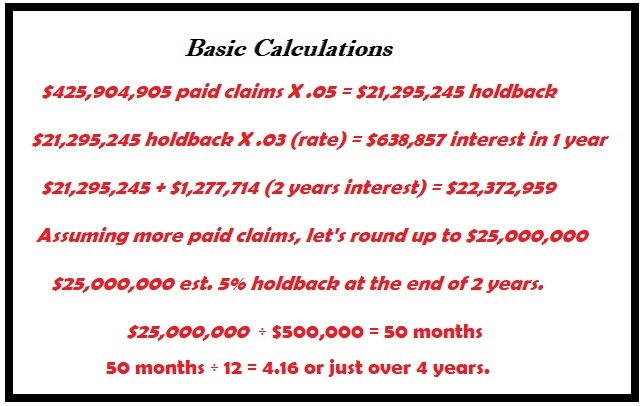 Class Counsel’s job is to get claims paid. The players should be Class Counsel’s sole concern. The NFL is capable of taking care of itself. Class Counsel should not feel obligated to help them at the expense of any member of the settlement class. 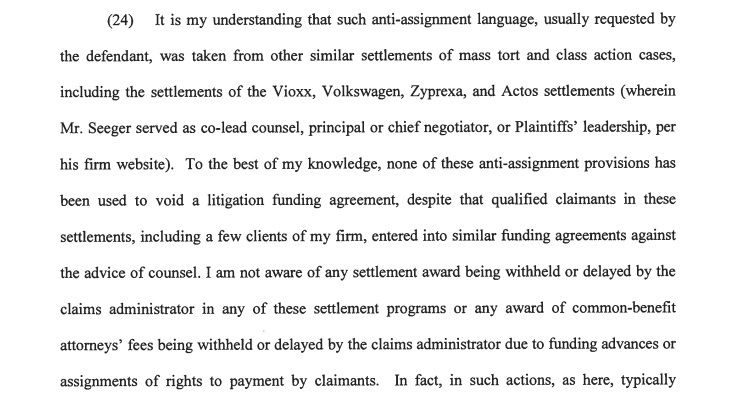 Seeger also cites his work regarding third party lenders. This work, however, is of Seeger’s own making. I’m not sure if it was a masterful ploy to increase his coffers or a colossal blunder on his part, but, in either instance, the result is the same—an additional burden on the common benefit fund that was established to alleviate players from the expense of compensating both class counsel and their personal attorneys. While the litigation took place, dragging on for years before the settlement was finalized, some players or their survivors, decided to take advances on their anticipated recoveries from litigation funders. Most had good reasons for doing so—a home under foreclosure, funds to cover increasing medical expenses and similar obstacles that were time sensitive. During this time, and as a settlement was negotiated, Chris Seeger served on the board of directors for Esquire Bank, a litigation funder. While Esquire charged considerably lower interest than many of its competitors, its advances were structured in the same way. 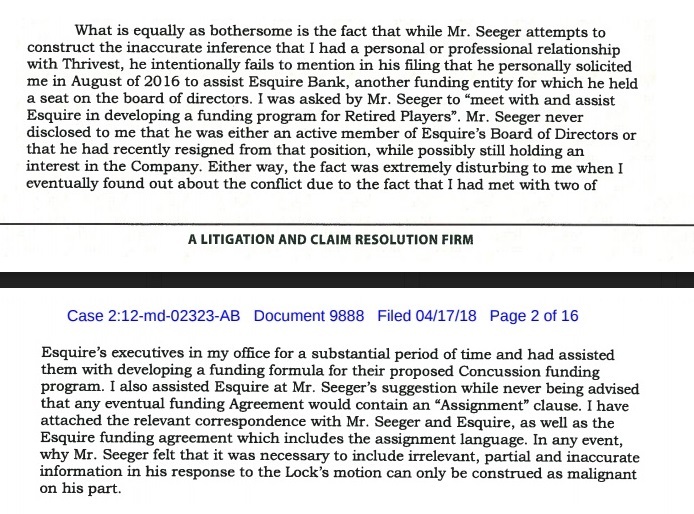 When the settlement appeared to be a “go”, Seeger began soliciting other attorneys to steer their clients who had need of immediate funds to Esquire. Evidence of this was first presented by attorney Craig Mitnick and later by other attorneys. Oddly, Mitnick’s letter to the Court was sealed almost immediate after he filed it. I was fortunate to have retrieved the document quickly, before its contents were shielded from public view. When I requested comment from Mr. Mitnick, he expressed that the sealing was a surprise to him and against his wishes—in fact, at his request I provided him the court-stamped version of the document. This is further supported in his remarks to ESPN’s Peter Keating. The excerpts below are relevant to this discussion. As stated in Mitnick’s letter, he attached the emails in which Seeger solicited him. There were more, but this small sample presents a pretty clear picture that at least between February 2015 and September 2016, Seeger didn’t have a problem with, and actually encouraged third party funding advances. This is further detailed in an ESPN Outside the Lines exposé. Note Buchanan is also an employee of Seeger Weiss. This is the assignment clause at the heart of the current controversy. As you can see it isn’t largely discernable from assignment clauses in other settlements in which contrary to the apparent reading, assignments were allowable. This was pointed out by attorney Mike McGlamry, who was one of many attorneys who responded to Judge Brody’s harsh words regarding attorneys not named Seeger who allegedly facilitated assignments for their clients after Seeger mounted attacks of his own in another filing. McGlamry explained that prior to Judge Brody’s order, neither he, nor others viewed the settlement language as different from other settlements they were associated with. McGlamry references a letter from Seeger to the class, dated July 19,2016, in which he warned them to be wary of predatory lending. 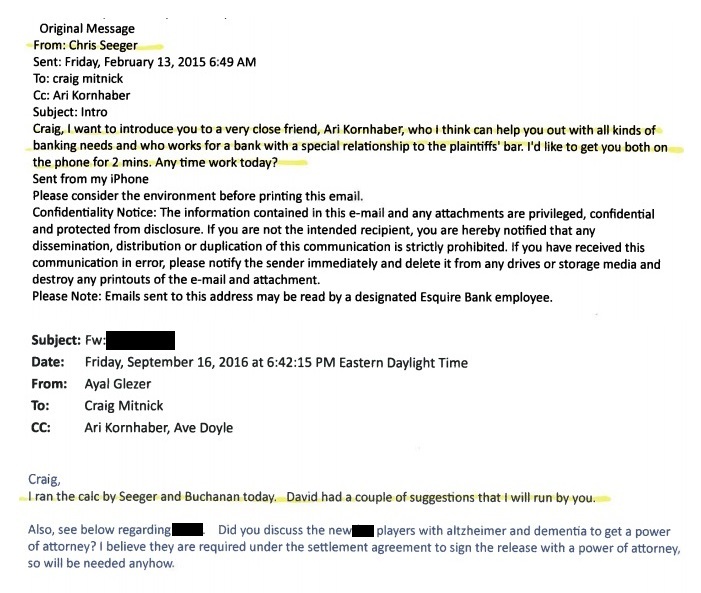 There was no indication, however that assignments were prohibited, and based on the September 16, 2016 correspondence provided by Mitnick, it appears that Seeger was concurrently working to facilitate claims assignments. In one swoop, whether intentional or not, Seeger managed to target competitors, whose loans were nullified by Judge Brody, while creating additional hours that are billed to the common benefit fund to litigate against the lenders who refused rescission and appealed Judge Brody’s order. 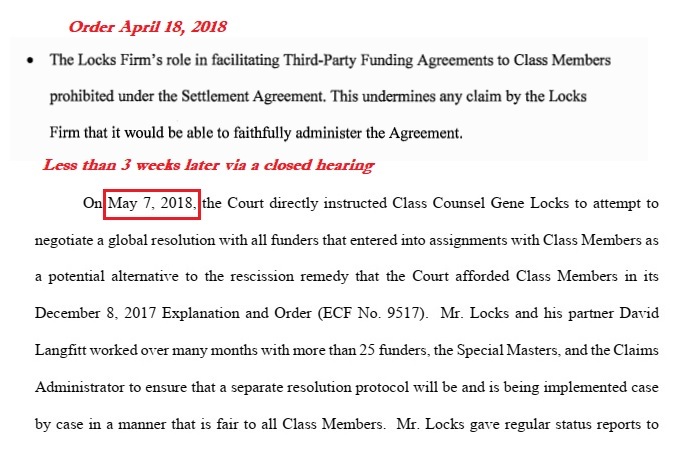 The entirety of Locks Law Firm’s allocation of $400,000 was on information and believe almost exclusively directed at negotiations with third party lenders—another curiosity since Judge Brody wrongly accused Locks of misconduct in facilitating advances and then did a 180 in appointing him to negotiate with the lenders less than three weeks later. It’s difficult to determine how much of Seeger’s $2.4 million ask was related to third party funding issues, but it’s probably safe to say it was a substantial sum. Professor Issacharoff argued on behalf of the class in oral arguments at the Third Circuit, last week, therefore it seems a safe assumption that his $17,290 portion was for work in preparation for the appeal. There doesn’t seem to be an immediate end in sight for the assignments issue and the resulting drain of funds from the common benefit. Whatever the ruling at the Third Circuit, I’d be shocked if the ruling isn’t appealed to the Supreme Court—and while only 1%-2% of cases receive a certiorari grant, because of the increase in both litigation funding and multidistrict litigation, this seems like a case they would be inclined consider. Lubel’s motion isn’t the first he’s entered requesting accountability regarding class counsel fees, it’s one of several, each of which have been denied. I would anticipate the same result here, despite the dire circumstances. Both the Court and Professor Rubenstein projected greater spending in the initial phase of settlement implementation, which is typical, however this settlement has been anything but. The lender issue could easily continue for another two years or more. The “generally consistent” issue has not been resolved and there’s no reason to believe the NFL will back down in its aggressive war against dementia claims, leading to yet more back-door litigation. Both issues are labor intensive and costly, necessitating work from partners as opposed to associates and paralegals. They are also above and beyond what was anticipated as day-to-day administrative tasks. What happens if the common benefit fund runs dry 59 years early? I’m not aware of this happening in another settlement and it is unclear what remedy might be pursued. I can envision a few possible paths, the most viable of which would be petitioning the NFL for additional common benefit funds despite the conflict of interest this would present. Whether Judge Brody grants Lubel’s motion or not, perhaps she will at least head his words and take action before spending reaches the point of no return.